Add multiple business account users to your account to give co-workers access to your Trustpilot Business profile. In some companies, you may want several people to have access to your Trustpilot Business account. Someone may be responsible for uploading customer data, while another person is in charge of replying to reviews. It's simple to add multiple users to your account. Log in to your Trustpilot Business account and select Company Profile from the left-hand pane. 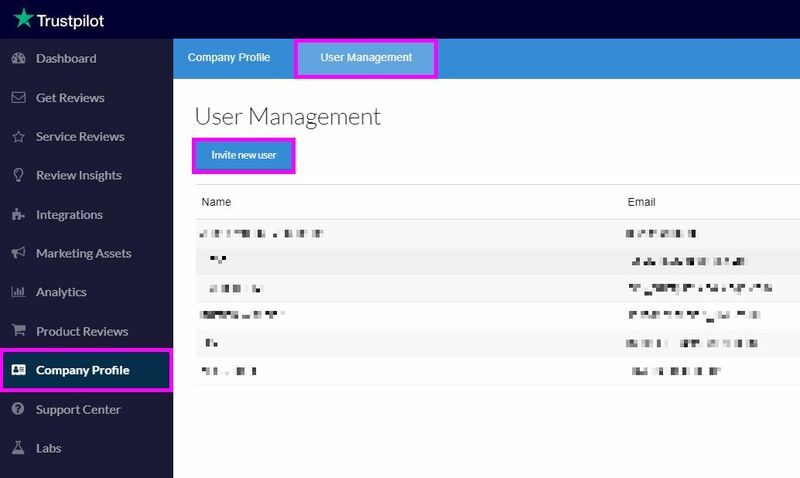 Select the User Management tab, then select the Invite new user button. In the Invite new user dialog, enter the new user's information in the fields. When you finish, select the Send invitation button. The user will receive a verification email. They must open the message and click on the Get started button. On the Set password screen, the user must enter a password in the Password field, accept Trustpilot's Terms and Conditions, then click the Complete setup button. If you need to give the user access to multiple domains, repeat this process for each domain. It's even easier to remove someone's access to your account. Select the red X on the right-hand side of the user's information. In the dialog, select Remove user to confirm this. Note: All users receive full admin rights. You cannot remove your own access.